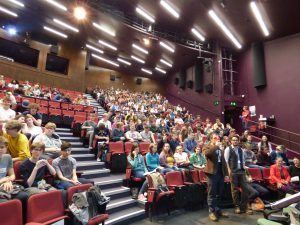 With the support of the University of Exeter, we were able to invite schools from across the region to attend a talk at the Northcott Theatre. Jocelyn presented and took questions from the audience for over an hour before traveling to EMS for lunch. 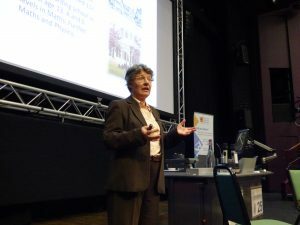 We learnt about her early experience of education and science when it wasn’t the “done thing” for a woman; we heard about her discovery of pulsars, widely reported as aliens at the time; she shared how her experiences had shaped her and how she’d overcome obstacles. Throughout it all, Jocelyn gave a down-to-earth and accessible talk that was truly inspiring. At EMS, Jocelyn had lunch with our essay competition winners (Frances Britton and Lily Kearney), our Physics teachers and some of our alumni. 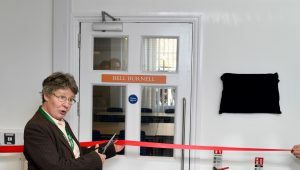 She then cut the ribbon for the official opening of our lab “Bell Burnell” and joined EMS students and teachers for a presentation about Dark Matter, given by Frances Britton, a year 12 student at EMS. Jocelyn was impressed by Frances and our other students, saying that she had never been anywhere quite like EMS before. 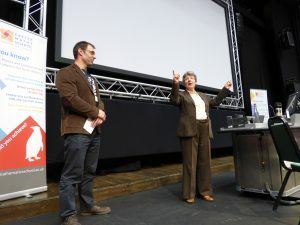 She even learnt something from Frances’s talk! After a few photos with students, Jocelyn travelled back to the university to round off the day by meeting with PhD students. Jocelyn’s career has been varied and, in her own words, unusual. There has been much controversy surrounding the fact that she never received a noble prize for her pulsar discover whilst her supervisor did. 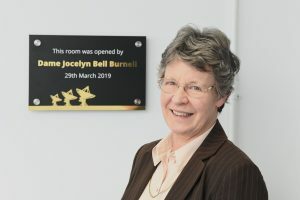 Recently she was awarded a prize of 2.3 million pounds in recognition of her work and leadership – she chose to donate this fund in its entirety to the Institute of Physics to provide support for those from backgrounds that are underrepresented in Physics to study for PhDs. 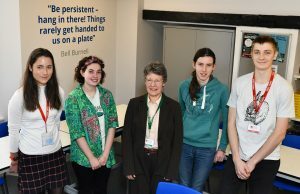 The Bell Burnell Graduate Scholarship is set up with the aim of increasing the proportion of female students, those from low-income backgrounds, refugees and other minorities in Physics.